So the Institute of Advanced Motorists have press released the fact that casualties are up on 20mph streets (deaths are down, but they were already in single figures, so that’s random). I thought it might be worth reposting this sarcastic rubbish that I bashed out last time some idiot tried to claim that an increase in casualties on 20mph roads is evidence of their failure. I heard on the lunchtime news on Radio 4 today the shocking news of an increase in the number of people injured on 20mph streets. Back when there were fewer 20mph streets, fewer people were injured on 20mph streets, they revealed. Now that there are more 20mph streets, more people are being injured on 20mph streets. This road safety intervention, they concluded, isn’t working. This watertight logic perhaps also explains why BBC News have been so quiet on the destruction of the NHS. Before the NHS existed, literally nobody at all died in any of the then non-existent NHS hospitals. Almost as soon as the NHS was created, people started dying in the newly created NHS hospitals. Clearly the NHS doesn’t work. Members of the Association of British Nutters will no doubt be getting very excited about these numbers, but before they make rash recommendations they should remember that back before the British motorway network was built, there were literally no people injured on the British motorway network, whereas now that the British motorway network exists, there are lots. I hope that the main elements of the astonishing innumeracy that went into the BBC story — the failure to put the raw numbers into any kind of useful context, either of the rapid growth in the number of streets with 20mph limits as it has become easier to set the limit (or their changing nature as 20mph starts to roll out beyond quiet residential streets onto busier high streets), or of the far higher number (and, more importantly, rate) of injuries and death on either equivalent 30mph streets or on the same 20mph streets before the speed was lowered — should be obvious. Needless to say, reducing speeds on a street from 30mph to 20mph cuts injuries, regardless of the entirely banal fact that those few injuries which remain will thenceforth be added to the tally for 20mph streets instead of that for 30mph. So, mockery over, there’s a more important point: should an increase in injuries, if there really had been one, automatically kill off further roll out of 20mph zones? It beggars belief that the council intend reducing the 30mph speed limit. A limit introduced when there was no such thing as MoT’s, ABS brakes, crash zones on the front of cars and good street lighting. I can see no justification in spending this money and would dearly love to know who Bristol City Council think it will benefit? It certainly won’t be the youth, disabled or elderly. Slower speeds are not a simple issue of cutting crude injury statistics. They’re more about reviving communities which have been spoiled and severed by traffic speeding through them, reclaiming a little bit of the public realm that has been monopolised by the motorcar, and enabling liveable walkable neighbourhoods to thrive. Far from “certainly no benefit for the youth, disabled or elderly”, we know much — some of the research having in fact been carried out in Bristol itself — about the many adverse effects of higher speeds and volumes of traffic, and the loss of shops and services due to car-centric planning and living and the blight of high streets by arterial traffic, on the mobility of those most excluded from the car addicted society, particularly the young, the elderly, and the disabled. If they’re lucky, these people will be forced into dependency on those willing to help them get around; if they’re unlucky, they will simply be left isolated and severely disadvantaged. But of course, we don’t like to acknowledge the existence of the large numbers of people who are excluded from much of our society, culture and economy by our rebuilding the world with nobody in mind except car owners. The injury statistics cited in the BBC News piece include minor injuries, which is most injuries at slow speeds — little things which don’t require a hospital stay. What are a few more cuts and bruises if it means that thousands of kids are free to walk to school with their friends instead of stuck inside mum’s car? Would we rather keep the infirm all shut up and sedentary with no access to the shops and the services they need, too intimidated by the anti-social behaviour of motorists to cross the road, than risk one person having a fall? These strands can be tied together by the other piece of context that would have been worth including in the BBC piece: in the same year that injuries in 20mph zones increased, injuries to pedestrians and cyclists in general increased — in part because there are more to be injured. It has always been the case that the great road safety gains that successive governments have boasted of have been won mainly by making streets so dreadful that people find them too frightening, stressful, unpleasant, humiliating or ineffective to walk, cycle, or do anything other than sit in a secure metal box on. Start making the streets a little bit less awful and people return to them. Like cycle tracks, which people still like to claim increase car-cycle collisions (they don’t) despite before-and-after studies largely ignoring the fact that the point of cycle tracks is to widen bicycle use from the confident and quick witted to the people who were are otherwise too scared, stressed or infirm to do so, so invalidating the before-and-after study design, an increase in minor injuries after speed limit reduction, even if it were really to happen, would be far from proof of a failure. The IAM make a thing of the DfT stats showing a 26% increase in serious injuries in 20mph limits and a 9% decrease in 30mph limits. Given that the base figures for the two sets are so different, that amounts to 87 more injuries in 20 zones and 1102 fewer injuries in 30 zones. Of course, the only figures that would really matter (in the absence of a double blind randomised controlled trial) are before/after comparisons of the streets that have switched and/or case-control studies of those streets (at least, for measuring injuries; as I said before, there are other important outcomes to 20 zones besides injury rates). 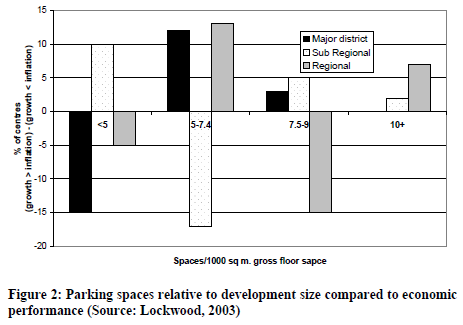 And given that these numbers are not (and could not really be) normalised to the changes in total length of the two types of street, and are influenced by far too many confounding variables, I wouldn’t dream of suggesting that they’re worth drawing any conclusion from. But if you’re intent on drawing a conclusion, given the trend in switching 30mph streets to 20mph streets, a net reduction in serious injuries of 1015 seems like a far more pertinent one than a 26% increase in injuries on 20mph streets. In writing up the Cycling Embassy’s AGM infrastructure safaris, I said some nice things about Bristol. I think it’s the least worst city for getting around by bicycle in Britain. 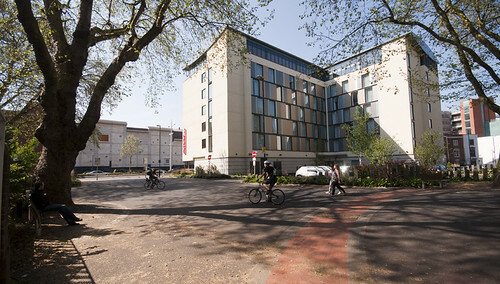 But despite the good things that Cycling England’s demonstration city project achieved, and the city council’s boasts about it, Bristol has failed to become a cycling city where it most matters. 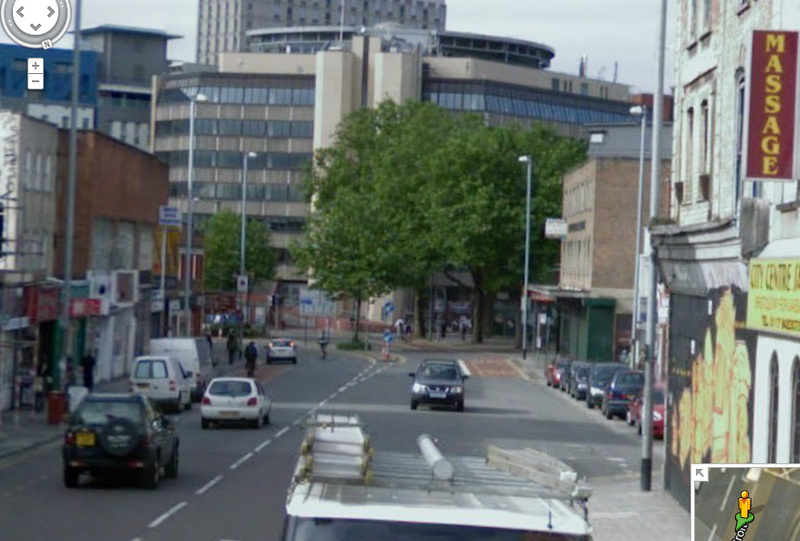 The city was named and shamed by The Times for one of the worst junctions in the country, the St James Barton roundabout — aka The Bearpit — on the inner ring road. Four lanes of circulating traffic forming a formidable barrier to getting into the city centre from the arterial roads that terminate here. 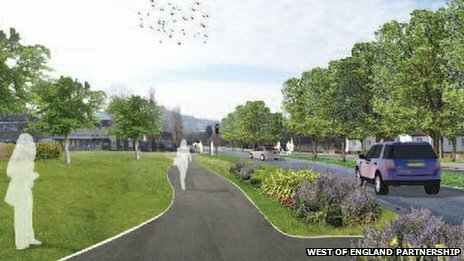 But while one wing of the city council considers new variations on the Great British shared facility — awkward kludges to work around the mistakes and omissions of the 1960s — another is independently working on “public realm improvements” just yards away, each apparently oblivious to what the other is doing. And neither of them seems to have a clue that this is a “cycling city”. 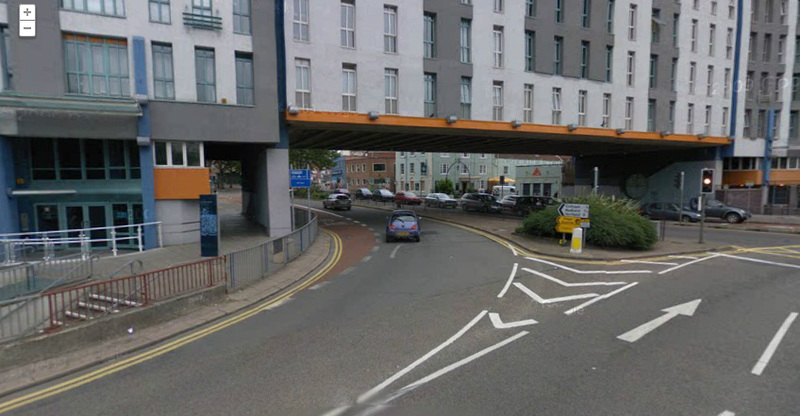 Regular readers might already be familiar with the street that they wish to improve: the A38, one of those arteries terminating at St James Barton. It’s variously Stokes Croft, Cheltenham Road, and later Gloucester Road. It’s the artery explored in this infrastructure safari, and, a few miles up, the high street that was the subject of this post on how people get to their local shops. …and finally, the section of sprawling highway ends abruptly where the old street dimensions and frontages survived the bulldozers… but suffered the years of planning blight from threats of road widening that left them in a poor state of repair and, when occupied at all, usually occupied by the city’s less wholesome businesses. There’s no doubt that this is a pretty foul place for pedestrians, with a cloud of fumes coming off the four lanes of stacked traffic waiting for the lights; and the cars speeding around the blind bend from the roundabout; and the acres of dead space in the non-standard road layout that encourages non-standard manoeuvres. So the city council are consulting on “public realm improvements” for this area, hoping to bring the pavements alive with people and street cafes. So what are these improvements? Taking out the bus lane to widen the footway, leaving cyclists with that thoroughly discredited facility, the 1.5m on-carriageway cycle lane, leading cyclists into exactly the same deadly conflict with the bus stop as before, and providing the ever delightful environment of buses pulling in and out inches to the left of you, speeding cars and trucks inches to the right of you. 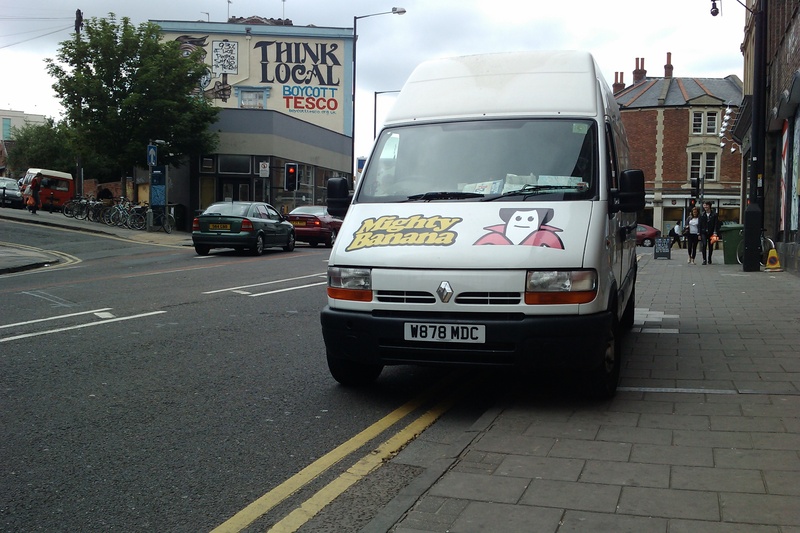 And acres of dead carriageway replaced with acres of dead pavement, and again, that widely tried and widely failed 1.5 metre cycle lane, a gutter sandwich between traffic and the driver-side doors of the loading and parking bays. 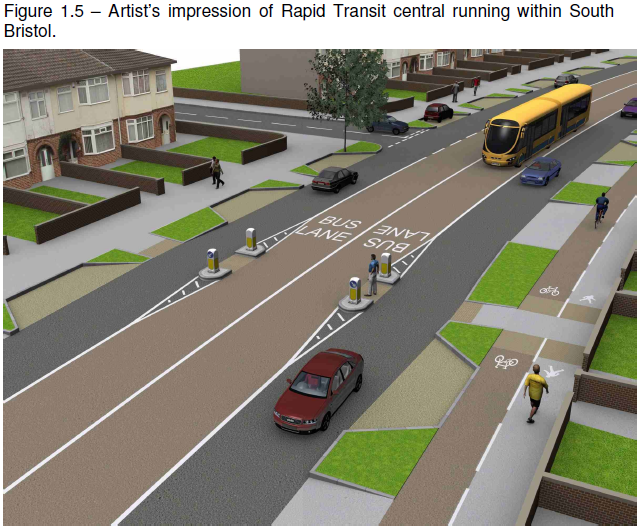 But it’s OK, the designers have thought about the needs of cyclists: the loading bays are supposedly “wide enough to create a safe buffer between car doors and passing cyclists”. And a raised table will apparently slow drivers down as they nudge the steering wheel slightly to turn across the cycle lane into that grossly distended side road, King Square Avenue, so that’s alright then. No doubt the trees and fancy fashionable paving will make this a less awful place to be on foot, but I’m not sure people will be rushing to set up pavement cafes next to the totally unchanged four-lane stacked traffic. It’s treatment of symptoms without addressing the real causes of the problems here. More to the point, it’s still useless if you’re on a bicycle, because, like everything built by the city’s highways engineers, it’s designed with Britain’s useless guidelines and rules. 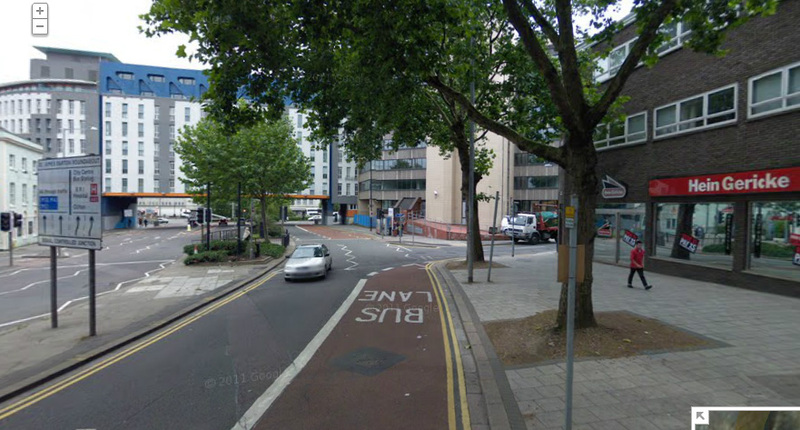 And that’s why Bristol’s authorities can not claim to be administering a cycling city. The great things that have been achieved in the city can be attributed to either the few excellent hard working cycling officers, or to the consultants and contractors bought in and guided by Cycling England during the demonstration city project. But the cycling office appear to have been put in a silo, able only to get paths put in where they won’t inconvenience anybody — through the parks, behind the allotment gardens, under the electricity pylons; and the hired expertise left when Cycling England and the demonstration city project went up in the bonfire of the quangos. The rest of the council seems to be as oblivious about cycling as any other authority in Britain: the highways department are as obsessed as any other with traffic flow and junction capacity; transport officers are just as obsessed with buses; parking enforcement just as powerless to keep cycle lanes clear; police just as indifferent to dangerous driving. It’s not a cycling city, it’s a city with a cycling department. 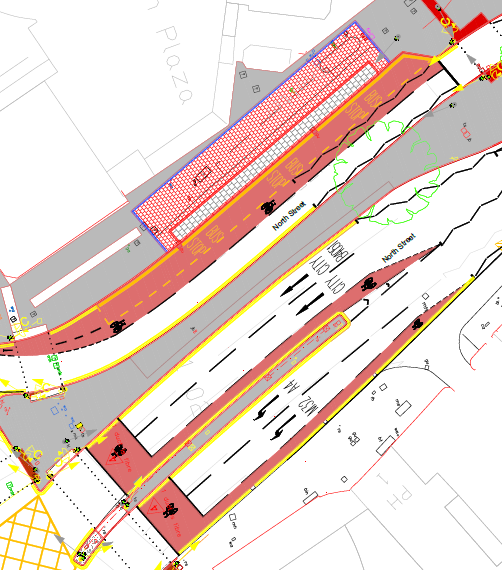 You can see it when a southern bypass is proposed with a 1.5m wide pavement cycling facility; when the flagship cycle path is suggested as the perfect location for a BRT line; when quaysides and riverside paths — crucial for linking together the network of traffic-free cycle routes in the city centre — are left impassable for years due to construction work (or lack of it); and every time the highways department puts in another 1.5m cycle lane in the gutter underneath the car parking. All of the candidates to be Bristol’s first mayor say they want to be in charge of a cycling city (even if one of them doesn’t mean it) and all of them recognise that there’s a way to go before they can claim to be so. If they’re to get there, they need all their officers behind them, not just the few in the cycle paths office. I hope that the main elements of the astonishing innumeracy that went into the BBC story — the failure to put the raw numbers into any kind of useful context, either of the rapid growth in the number of streets with 20mph limits as it has become easier to set the limit (or their changing nature as 20mph starts to roll out beyond quiet residential streets onto busier high streets), or of the far higher number (and, more importantly, rate) of injuries and death on either equivalent 30mph streets or on the same 20mph streets before and after the speed was lowered — should be obvious. Needless to say, reducing speeds on a street from 30mph to 20mph cuts injuries, regardless of the entirely banal fact that those few injuries which remain will thenceforth be added to the tally for 20mph streets instead of that for 30mph. Like cycle tracks, which people still like to claim increase car-cycle collisions (they don’t) despite before-and-after studies largely ignoring the fact that the point of cycle tracks is to widen bicycle use from the confident and quick witted to the people who were are otherwise too scared, stressed or insecure to do so, so invalidating the before-and-after study design, an increase in minor injuries after speed limit reduction, even if it were really to happen, would be far from proof of a failure.